How did you become involved in The Voice of Domestic Workers? As a domestic worker who has worked here in the UK and abroad, I have experienced different forms of abuse, including sexual and financial abuse. I was scared but at the same time angry because my employers thought they could treat me however they wanted. To protect myself, I have done such things as going into the kitchen to arm myself with the knives and hiding them, sometimes in my underwear. In the beginning, I thought it was only me who had abusive employers. But then I started to see fellow domestic workers in worse situations. The Voice of Domestic Workers was established in March 2015. It is a self-help group run by and for domestic workers and campaigns for their rights and welfare in the UK. I coordinate the project, fitting it around my job as a domestic worker. But I couldn’t do this without the support of the union Unite and people who were with us from the very beginning. We empower domestic workers by providing them with education and training. We train them to speak up about their work hours and pay. We also make them aware of their legal rights. "We’ve had occasions when service users have not attended our services because they are too scared to get help. If one of them has been arrested in a clinic or a hospital, that word travels very fast. "Part of our work involves attending events or giving evidence when there’s a policy review. However, it can be hard for beneficiaries who want to be involved to be excused from their work commitments. Sometimes, we write a letter to their employers to ask if they can participate. "Support of employers is vital in our campaign work." Some of our beneficiaries are undocumented workers, and we never know when they are going to be arrested and deported. But we will still offer them advice and provide training. It means that if they do get sent home it is not a dead end but a new beginning. We also support domestic workers to help them overcome any trauma they develop after working for abusive employers. Some need medical assistance because they have difficulty in accessing NHS services given their undocumented status. What issues have you campaigned on? 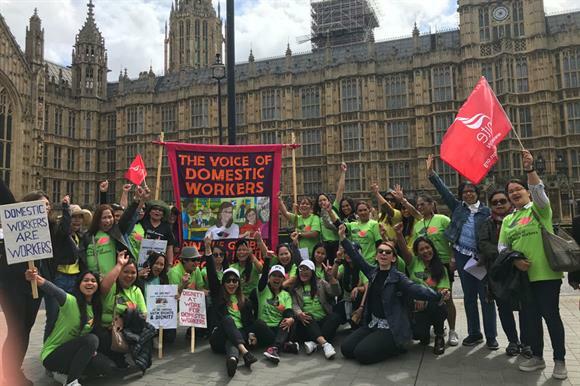 We fought for migrant domestic workers' rights to be included in the Modern Slavery Act. However, the act was made a law without this. Barrister James Ewins’ review recommended that the government should reinstate the right to change employer and the right to renew their visa for two years after the first six months of their stay. However, only the right to change employer was reinstated in 2016. The right to renew a visa is needed because very rarely would an employer employ a domestic worker for less than six months, so many become undocumented. As a result, migrant domestic workers remain a very vulnerable part of the workforce and of society. We are currently cooperating in research that we hope will improve police treatment of domestic workers. Sometimes the police lock up domestic workers who turn to them for help because they are seen to not be fulfilling the requirements of their visa. They simply become an illegal immigrant. This has got to change. We are open to dialogue with the police and have invited them to our events. We don’t view the police as the enemy and help them with their inquiries and investigations. In turn, we want them to treat domestic workers more compassionately. This will encourage domestic workers to step forward and report abuse. A review of the Modern Slavery Act is going on and we are scheduled to give oral evidence. We are also working on our very own Domestic Workers Bill. Domestic workers are workers. They should have the same rights as other workers, even if they are migrants.